This gingery, garlicky chicken comes together quickly to make an easy meal. Serve with rice. 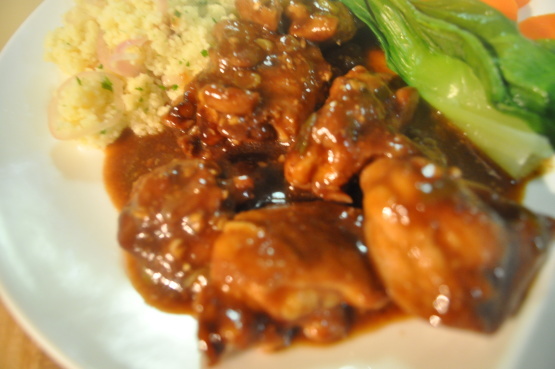 Marinate chicken thighs in the dark soy sauce for at least 1 hour. Heat oil in a large frying pan over medium heat. Add in garlic and ginger. Saute long enough to allow the ginger and garlic to release their aroma. Add in the chicken and saute until golden brown. Add in green onions, chicken broth, oyster sauce, rice wine, light soy sauce and sugar. Stir well. Once the sauce starts to boil, about 3-5 minutes, mix in the cornstarch to thicken the sauce.